Terrifying mobs of young men armed with panga (machetes), rungus (wooden clubs) and bows and arrows stormed through the streets of Nakuru on Friday. The market town, the capital of Kenya's Rift Valley, has not witnessed scenes like this for many years, if ever. It is about two and half hour's drive from Nairobi to Nakuru and as we came into the town on the main road we were confronted by a mob advancing down the tarmac. A stone smashed a back-door window of our car, crashing against the head of my colleague Nawaz Shah, showering him with broken glass. He was not badly hurt and our troubles were nothing compared to those of hundreds of people in the town who had been attacked or forced to abandon their homes. Ezekiel, a security guard watching over a petrol station, said he had left his wife and child in their home that morning and he had no idea whether they were safe. "They are crouching there in the room all alone. I told them not to move and it is now too dangerous for me to get near them," he told me. All around us people were hurrying away from a junction where another petrol station had been set on fire. 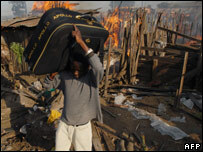 More than a dozen people have been killed in a frenzy of violence in the town, and dozens of properties have been torched and destroyed. Many Kikuyus, driven from their homes in other parts of the Rift Valley, have come to Nakuru in the past three weeks seeking shelter. They accuse mobs of Kalenjins, another tribal group, of launching attacks on them in the north of the town - trying to drive them out. Attacks three weeks ago were sparked by the disputed election, but the fighting has now taken on a different complexion. Old inter-ethnic scores, some going back generations are being settled. Many relate to disputes over land which different communities claim was stolen from them. In the centre of the town shops and businesses started to close down and by the middle of the afternoon, nothing was left open. Fear is etched deep into everyone's faces. Groups of terrified residents were suddenly running headlong out of the parts of town they live in, because they heard that houses were being attacked and set on fire. Many people have abandoned their homes altogether. The road leading south out of Nakuru towards Nairobi was dotted with vehicles piled high with belongings: chairs, sofas, tables, pots and pans, chests of drawers and in one truck we saw, a cow. Many do not know where they are going - they simply know they must get away. 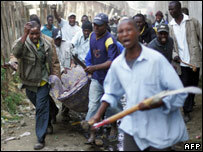 The town of Nakuru is no stranger to inter-ethnic strife. For many years it has been eased and contained, but now it has erupted in sickening acts of murder and brutality.